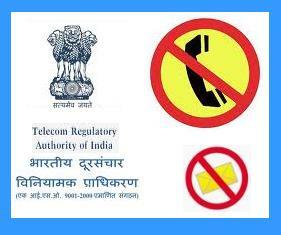 In a bid to curb pesky calls from telemarketers, Indian Telecom regulator TRAI issued new rules include a fine of Rs.5000 for each complaint on a telecom operator if found that the unsolicited commercial call (UCC) or SMS was made by unregistered telemarketers using its network. TRAI also said that the basic phone or Wireless / Mobile connections of Banks, Insurance firms and Realty players will be disconnected if rules of unwanted calls (Unsolicited Commercial calls) and SMSes are flouted by them, or on their behalf. “It is the duty and responsibility of the service provider to ensure that such misuse does not happen in their network,” the Telecom Regulatory Authority of India (Trai) said in a statement. TRAI is strictly monitoring and enforcing the regulations for protection of customers from Unsolicited Commercial calls and SMSs. TRAI observed that telemarketing activities were encouraged by mobile service operators by providing attractive or low-cost SMS packs and by allowing bulk/multiple connections without following the CAF (customer acquisition form) directives issued by the Department of Telecommunication (DoT. According to TRAI’s latest Telecom Commercial Communications Customer Preference (Thirteenth Amendment) Regulations, 2013 “If on verification of a complaint it is found that the UCC has been sent by a subscriber who is not registered as a telemarketer, the service provider shall be liable to pay financial disincentives of Rs.5000 on each complaint. Just because telcos have records of calls & SMS makes them easy prey for TRAI ? Who is going to nab the real culprits — Real Estate Developers & DSAs of Banks, Credit Cards and Insurance.